Beside HTTP, nginx is also able to handle TCP- and UDP-traffic as well and it can also inspect the so called Client Hello of TLS using the preread module, to route based on SNI (Server Name Indication) which is an extension in TLS. For Upstreams, please visit the nginx: Basic Load Balancing page. This expects that the upstreams are correctly set up. SNI Upstream Maps are a powerful feature if you have multiple servers behind your reverse proxy and every server maintains their own certificate and you do not want to or cannot use your own certificate. In such cases, you can use it to forward the traffic based on the Server Name Indication extension in the TLS protocol (given that TLS is used). This will not work anymore with ESNI which may be published with TLS 1.3. If it causes trouble, do not enable encrypted SNI and stay with plain SNI. Also keep in mind that when SNI Upstream Maps are used, the connection will not be decrypted on OPNsense, so you cannot load balance a TLS connection to unencrypted servers. The upstream servers are the TCP and UDP load balancing feature of nginx. You may use it to proxy DNS, some proprietary protocols etc. The listen port is the port used to expose the service to the clients. You should use the standard port defined by IANA to maintain best compatibility with most clients. In case you are proxying UDP datagrams, you must enable the “UDP Port” checkbox. Select a certificate if you want to terminate the TLS connection. 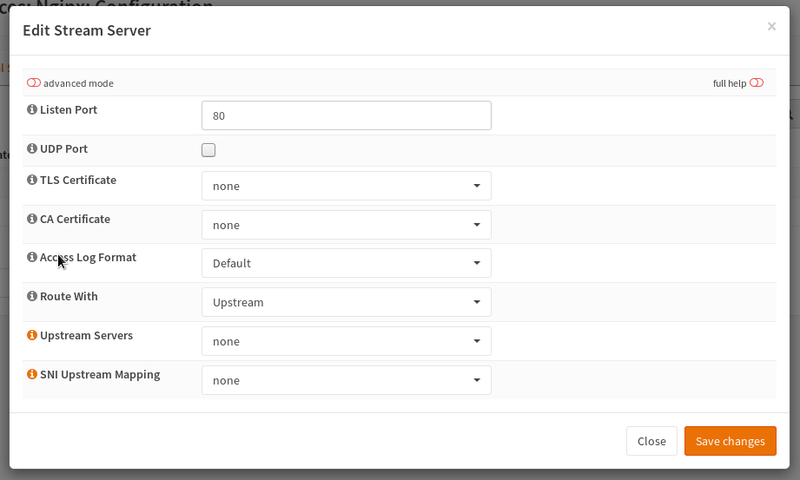 If you route directly with upstream property, the upstream TLS settings are used, to choose if the backend connection should be TLS encrypted (again). If you want to use an SNI Upstream Map, switch the entry in “Route With” and choose a mapping in the coresponding entry. In the advanced settings, you can also force TLS based authentication for upstream backends (not supported in SNI Upstream Mapping).